Under the cover of darkness on this date in 1942, over 100 British para­troopers kicked off Opera­tion Biting when they para­chuted into Nazi-occu­pied Nor­mandy close to a Ger­man radar sta­tion in the tiny vil­lage of La Poterie-Cap-d’An­tifer, 12 miles north of the large French har­bor of Le Havre. A num­ber of what were in­ferred to be ground radar instal­la­tions had been iden­ti­fied by the Royal Air Force during aerial recon­nais­sance in 1941, but their exact pur­pose and, of course, the nature of the equip­ment housed in­side were yet un­known. On landing, the para­troopers quickly over­came the lone sen­try guarding the Wuerz­burg radar array, dis­assembled the dish an­ten­na as a near­by enemy pill­box fired on them, removed and packed im­por­tant com­po­nents, and left for the near­by beach at Brune­val. (The com­mando-type raid is some­times known as Opera­tion Brune­val.) From the beach six Royal Navy landing craft took the raiders and their booty, in­cluding one Ger­man radar tech­nician, back to Eng­land where the tech­no­logy could be studied and counter­measures designed and im­ple­mented to neu­tral­ize its effec­tive­ness. That was when Brit­ish scien­tists dis­covered that all Ger­man ground-based radar sta­tions oper­ated on a small num­ber of fre­quen­cies, and that the radar sta­tions could be easily jammed by air-dropping alu­mi­num strips (vari­ously called “win­dow” or “snow­flake”), there­by swamping an oper­a­tor’s radar screen with mul­tiple returns. Oper­a­tion Gomor­rah, the huge and devas­tating Allied bombing raids on the north German port of Ham­burg in late July/­early August 1943 suc­ceeded in part by using this re­flecting chaff. Even though Ger­mans had pio­neered its use—chaff was known as “Duep­pel” in Ger­man—they did nothing to pre­pare them­selves for its use by the enemy. The month before Go­mor­rah, after a Brit­ish photo inter­preter had iden­ti­fied a stack of Wuerz­burg dish an­ten­nas in a manu­fac­turing yard in Fried­richs­hafen on Lake Con­stance (south­ern Ger­many), Prime Minister Winston Chur­chill ordered the RAF to bomb the site. Not­with­standing suc­cess­ful Allied counter­measures and the 1943 aerial as­sault on the sus­pected pro­duc­tion facility, some 4,000 Wuerz­burg stations found their way into Wehrmacht service starting in 1941. 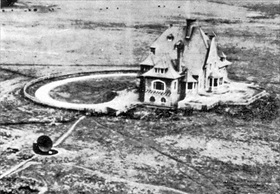 Left: RAF photo-reconnaissance picture of the Wuerzburg radar array (dark round object left in photo) adjacent to the Bruneval villa, Normandy coast, December 1941. 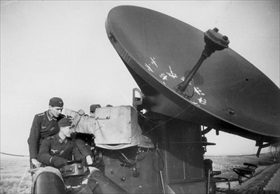 Right: Wuerzburg radar apparatus installed near the English Channel, France, 1943. The February 1942 Brune­val raid provided Brit­ish in­tel­ligence with a close-up view of the new Ger­man air defense radars: their vital com­ponents, how the radar equip­ment was used, and on what fre­quen­cies the radar operated, all of which were cru­cial if Allied long-range bombers and fighter air­craft were to operate effectively over Nazi-occupied Europe. 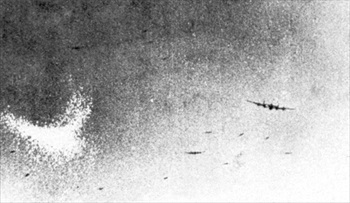 Left: An RAF Avro Lancaster dropping metallic chaff (the crescent-shaped white cloud in the left of the picture) to inter­fere with anti-air­craft batteries during a thou­sand-bomber stream over Essen, Germany. No date. 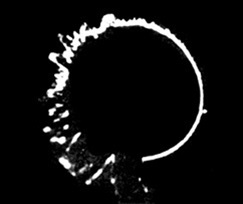 Right: The effect of chaff on the display of a Giant Wuerz­burg radar scope. The effect of jamming appears in the left “jagged” half of the cir­cu­lar ring, con­trasting with the normal “smooth” (un­jammed) display on the right half of the circle, with a real target at the 3 o’clock posi­tion. On the jammed left side, the real target “blip” would have been in­dis­tinguishable from the chaff.